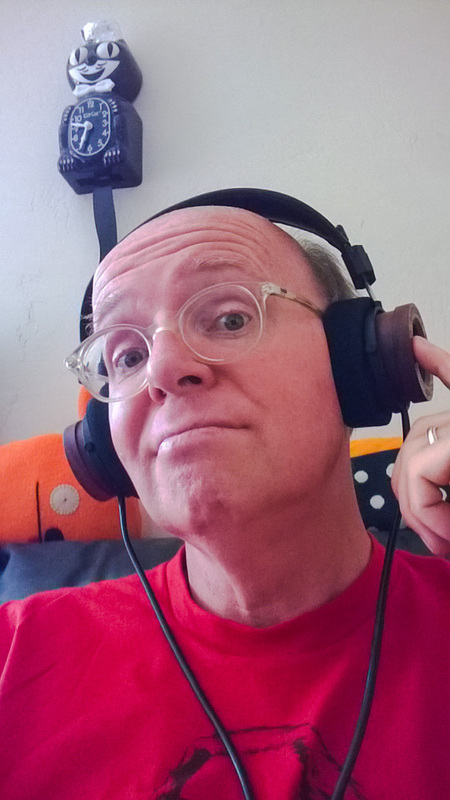 I am not big on selfies, but Grado Labs headphones require visuals to appreciate, because they’re like none other. I cleaned out all my birthday money and added Craigslist sales (e.g., my Sony Premium Bluetooth headphones) to buy a pair of RS1e. About 18 months ago, I sold my RS1i for the wireless convenience of the Sonys and regretted right away. While I’m enjoying the new Grados, which deliver terrific soundstage and detail, the audio is a bit tiny to me compared to the RS1i or Sony MDR-1RBT. The cans require some break-in period, before the full fidelity breathes, and I’m only about 15 hours into what really should be 50. Grados get better with use, and I can hear the difference already. Some of that is subjective, as you get accustomed to something else. The Sonys were too bassy for my aging ears. Grados are open-ear—there’s no noise-isolation for you, bud—but they produce a more natural sound even listening to MP3s. The nuances and details are so remarkably fine, some songs sound nearly new, like I’m hearing them for the first time.